When you make pulled pork, chances are you’ll have a lot of leftovers. This is fantastic because it will taste just as good a day or two from now as it did when it was freshly made. Of course as it “ages” it gets better than ever. That’s because the seasonings continue to infuse and mix their flavor into the meat. Just naturally more delicious. But how long is pulled pork good for in this left over state? Does pork meat need to be eaten any sooner than other kinds of meats, or can you eek out a solid week of it in the fridge? Or even eat it months from now from frozen? These are valid questions, and of course it depends on how you both store and reheat your pulled pork. Don’t worry, it’s not too complicated, and in this article we’ll break down how to best save your pulled pork and methods for reheating, reusing and frankly, re-enjoying. 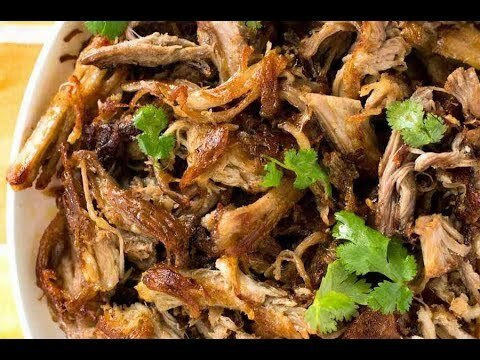 Then we’ll look at a recipe for making delicious pulled pork carnitas at home and what to do with the leftovers because trust me, you’ll have a TON of leftovers. From LA in Southern California to Kansas City, Memphis or South Carolina there are so many awesome cooking styles for this fatty, white meat. And whether it’s mixed with salsa and rolled up in a tortilla or smoked and drizzled with BBQ sauce in your electric smoker, you won’t want your tasty, pulled pork leftovers to ever go to waste. The fact is you get so much pulled pork out of just one cut, you’ll probably need to save some of that meat for another time. That means you’ll either have to pop it in the fridge or freeze the pork for later. Thankfully, pulled pork will be just as juicy and tasty as when it’s fresh out of the cooker. So, not to worry – you can use your leftovers for house guests, parties or just when you’re craving a Mexican-style pork taco or a bowl of shredded BBQ pork. Can You Freeze Pulled Pork? One of the best parts of pulled pork is how easy it is to freeze and enjoy for later. It’s just as good reheated as it is after being cooked an hour ago. Freezing it doesn’t do anything to the quality of the product, thank goodness. How Long Does Frozen Pork Last? Pork shoulder, pork loin and ground pork can all last 6-8 months in the freezer. According to USDA guidelines, the longest you’d want to leave any fully cooked pulled pork in the fridge before freezing it is 3 to 4 days. Any more than that and you’re risking it going bad and needing to be tossed out. That would be a waste, now wouldn’t it! If you have any questions at all about how long is pulled pork good for, you can always just pack it up and freeze it to be safe. You’d rather go to the trouble of having to thaw it out and defrost it later than have it spoil. Best Way to Store Pulled Pork? You’ll want to pack that pork away into food storage bags or airtight containers, then put them in the fridge or freezer for later. Just make sure you get as much air as you possibly can out of those bags to make sure everything inside stays fresh for however long they’re stored. I highly recommend getting yourself a vacuum food sealer, that will make saving and storing that pork so much easier. Either way, make sure you get yourself bags that are thick enough to last long-term if freezing and thawing. After all, any kind of meat isn’t much if it’s freezer burned. If you don’t have special thick bags, you can wrap your regular bags in aluminum foil or freezer paper for an added layer of protection. Getting all the air out will preserve the flavor and moisture in the pork that makes it so good in the first place. Next, be sure to flatten your bags as opposed to having the meat rounded like in a bulky sack. That way, you can freeze your pulled pork into easy-to-store, thin, flat portions that you can stack and then conveniently pop in and out of the freezer whenever you need them. Finally, to make sure you know how long your pulled pork will be good for, make sure you grab yourself a sharpie and mark down on the freezer bags when the pork was stored. Once you have them air-tight, flattened, sealed and put away in that freezer, you can again plan on them being good as new for anywhere between six to eight months. That’s almost half a year of fresh, good-as-new pulled pork ready to enjoyed whenever you’re looking to enjoy it. The best way to thaw out that pork when you need it is to refrigerate it overnight, then put it in cold water until it’s fully unfrozen. Just like any other leftover meat, you’ll need to reheat that pork to about 165 degrees before it’s good to go again. If the pork ends up a little bit dry, you can simmer it in some broth or some of that tasty original sauce if you saved it on the stovetop to make it good as new. Get it up to 250 degrees and you’re ready to go, just like it came right out of the pressure cooker again. You can also reheat it in your smoker; just monitor the temp and watch for dryness. If you’re looking for a quicker approach than on the stovetop, you can easily pop it pork in the microwave instead. Just keep in mind, microwaves tend to reheat things unevenly, so make sure you stir up that pork frequently to make sure everything is heated up. Once you have that pork reheated, you can easily use it for so many different things. That pulled pork is a really versatile food, giving you a ton of options for what you can do with it once you have it thawed out. Think salads, casseroles, pasta, and anything you might do with pulled/shredded chicken. Unsurprisingly, you can easily find some great recipes online that lays out the whole thing for you step by step. With only five minutes of prep time needed before your pulled pork is ready to go into your pressure cooker like an instapot and start cooking, this is a stupid simple recipe that any cook of any level can get down. All you really need are a few spices, a decent cut of pork and a slow cooker, then you’re ahead of the game. For the cut of pork, I recommend either shoulder, either bone-in or bone out. It’s going to fall off that bone after it’s time in the slow cooker anyways, so I’d understand if you wanted to save yourself the trouble of fishing that bone out later. The most important part is making sure the meat is skinless so the mix of cumin, olive oil, oregano, onion, salt, pepper and jalapeno can marinade in that slow cooker, giving it that iconic LA carnitas flavor. Once you have everything in the slow cooker, now it’s just a waiting game. You’ll want to cook that pork on low for 10 hours or on high for six hours. Any more will dry it out and make it too tough and stringy and any less will leave you with raw pork, a major no-no. After your pork comes out of the slow cooker, your next step is to shred it up into delicious, bite-sized pieces. It should be tender enough to just tear apart with two forks, giving you those tasty shredded chucks to go on your carnitas tacos or in your quesadilla maker. This shouldn’t take more than about ten minutes or so, depending on the size of the roast you chose. The bigger it is, the longer it would take to carve up. For next level pulled pork experiences, it’s super important to brown the pork in its own juices in a cast iron or electric skillet. In fact, now that you know how long pulled pork is good for, you can use this browning technique as a way to reheat and crisp up leftover pork. The key is to save as many of those natural pork juices mixed with the broth you put in the pressure cooker at the start, then transferring that into the pan for browning later. That’s a major key to getting that authentic, Mexican-style taste. You’ll want to collect only about 2 cups max of that leftover juice. That would be the perfect amount for that browning process. If you have any extra beyond those two cups, throw it in a separate container and save it for later. That will come in handy when you’re reheating that pork later on. You’ll also want some warm corn tortillas, either homemade or store-bought are fine, some chopped white onion, a few lime wedges and some shredded cabbage ready to top off those tacos. If you’re feeling particularly adventurous, you can throw some homemade guacamole, Pico de Gallo or salsa on top to really make those flavors pop. This tasty pork goes well with almost everything but some of my favorites are with delicious Mexican fried rice or wrapped up into a giant burrito. If that’s too difficult for you, here’s a YouTube video to break it down for you. Once you tackle the most difficult part of the recipe, slow cooking that delicious pork to juicy, crispy perfection, it’s a pretty simple process. Remember all the way back at the beginning of this article when you were convinced that making and enjoying your very own Mexican-style pulled pork carnitas tacos was going to be more trouble than it was worth? The pork is super easy to cook, crazy easy to store delicious for up to eight months after you cook it. That’s just too good to pass up. If you can’t make it out to California soon to enjoy some carnitas and some los angeles vacation home rentals, making your own is the way to go. You can keep that authentic, LA-style, leftover pulled pork taco right in your freezer, good to go whenever you’re in the mood for a taste of that SoCal or Southern BBQ flavor.